It's our fourth annual #GratefulToGodChallenge! Being grateful for the people in our lives and the stuff that we have is great BUT if we aren't giving thanks to the One who gave us those things - we don't really understand Thanksgiving. When we choose to find contentment from the Giver of life - even when we go through difficult times - we can be overflowing with thankfulness. May we be strengthened in our faith! During the month of November, let's fill social media not just with general thanksgivings towards objects or people but with praise specifically to God! 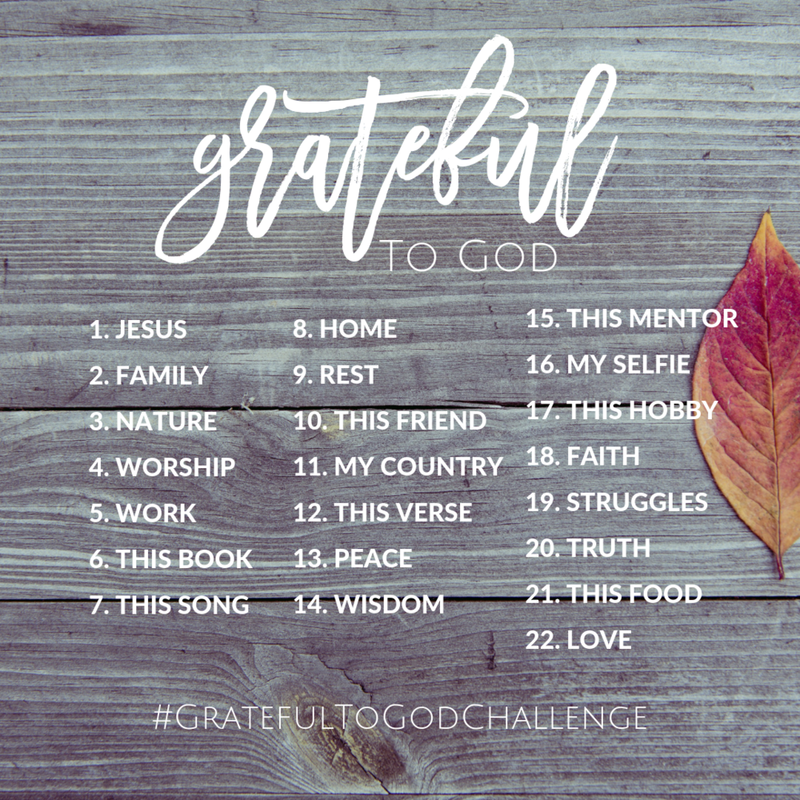 Leading up to Thanksgiving in November we will post on our Grateful to God Challenge Facebook group & Instagram. The graphic will include a word and Bible passage that inspires your gratitude like the one directly above. You can comment on the thread with a grateful comment, a Bible passage, or share an image that you believe captures your gratitude based on the word from that day. Use #GratefulToGodChallenge so we can see all the praise across social media! Each week, we will randomly choose a winner from the comments across social media to win a giveaway! Go to our Grateful to God Challenge Facebook group and click the "Join" button at the top. 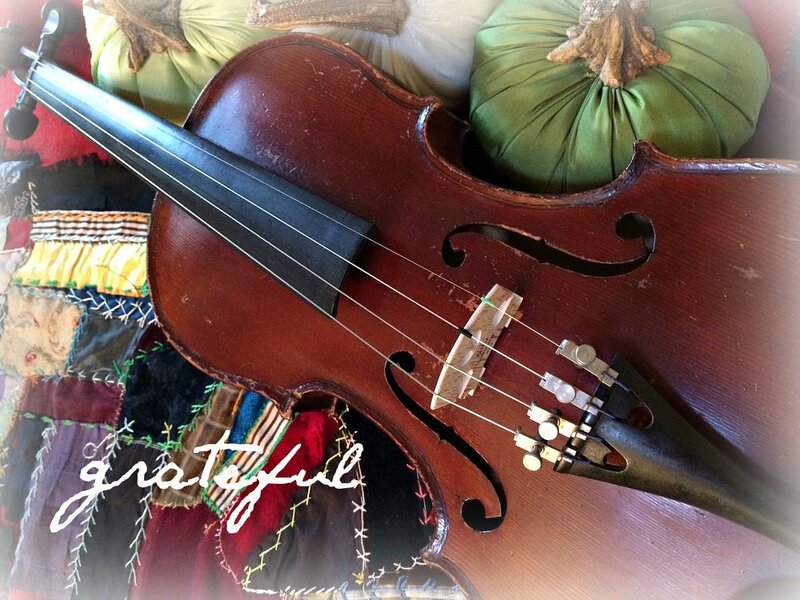 What traditions do you celebrate on Thanksgiving? On Thursday of this week, most working Americans in the United States will receive a paid holiday to celebrate a national Thanksgiving Day, a day of feasting, family, fun and of course thanksgiving. It is estimated that 46 million turkeys will be eaten on this day and about the same number of people will travel to get to the place where they eat this traditional meal. At Holy Hen House, many readers have participated in our Grateful to God Challenge. Though not yet a tradition, we are in the second year. The stories and reflections are poignant, heartwarming and sincere! We thank our readers for the messages of faith, family, and friends that God has moved them to share. We look forward to more as the month continues. As these posts have attested, the fabric of our lives can be filled with joy and gratitude, no matter what our present circumstances. After all, we have been rescued and redeemed by a risen Lord! As women of faith we sing and make music to God with the attitude of gratitude that sets the tone for every family interaction. A forgotten fact about American Thanksgiving is the perseverance of a woman named Sara Josepha Hale. For 17 years she crusaded to make Thanksgiving a national holiday. In support of the proposed national holiday, Hale wrote letters to five Presidents of the United States: Zachary Taylor, Millard Fillmore, Franklin Pierce, James Buchanan, and Abraham Lincoln. "We are imperfect women spurred on by God’s perfect grace..."
Now, that’s a tradition we can all get behind. From Holy Hen House, have a joyful and grateful Thanksgiving! why so thankful? the reason is coming. You're jotting down your thanks in a journal every November morning. You are one of the hundreds of women joining us for our Grateful to GodChallenge. Or you and your family are sharing what you're thankful for around the dinner table each evening. Or maybe you have one of those sweet little thankful trees on your sideboard, twigs holding the handwritten thanks you've scribbled on paper leaves. So why are we so thankful all of a sudden? Well, it's November! It's Thanksgiving! Of course we're thankful! Yes, Thanksgiving. True, true. I haven't forgotten. But I think all this thankful is because of something more. This gratefulness is because it's already here. Advent. Maybe not in formality, but our hearts already feel it, feel His coming. The Son of God is on His way and we can't help but whisper thanks and write them down, our humble offerings set at His feet. Jesus' coming is why we reach for the hands of our loved ones, why we speak the ways His blessings impact our lives. He is why we gather family in close, heads bowed in prayer and break bread together around pretty decorated tables. His coming is the reason we want to spread joy and wrap up gifts. He's the reason we already have the irresistible urge to hang twinkle lights up in every corner and then admire them from a cozy spot on the couch. Our hearts are already counting down the days and the Advent calendar isn't even displayed yet. The entire holiday season feels so special and intimate and wonder full. And we know why. He is coming. He is near, almost whisper thin and close enough to touch. The Word in the flesh.